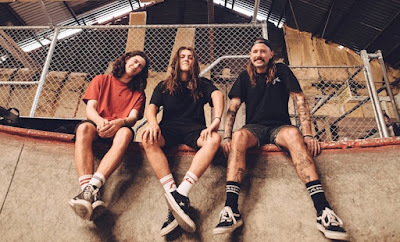 Perth's indie punks Good Doogs - Asher Iriks (vocals, guitar; Dylan Brown (bass) and Michael Grainger (drums) - are back in full force with their new single 'Nobody/Alone'. Following last autumn's 'Want That', the three haul out another three-minutes of vibrant surf-soaked rock, with dancefloor guitar melodies and a pummelling backbone of drums that are juxtaposed against Asher's woozy vocal delivery. "The track is about getting up the courage to leave the house because all your friends want you to, but once you are out – everything and everyone is still too overwhelming that you just want to get back home, but your problems are still there too," they say. "So it’s basically about anxiety and how it can ruin your life."